I made some nice Irish Potato Soup for Saint Patrick’s Day. It’s smooth and creamy without being heavy or fattening. I even decided to peel the potatoes for a fancy looking soup. As many of you know, I’m usually anti-peeling because it takes extra time & there are so many nutrients in the peel. But, I wanted this to have that smooth mouth-feel and that creamy texture that you just can’t get with peels in the soup. The roasted garlic adds a really nice flavor to the potatoes without overpowering them. If you really love garlic, you could use a whole head instead of half of a head of garlic. But, then, I might call it Garlic-Potato Soup. 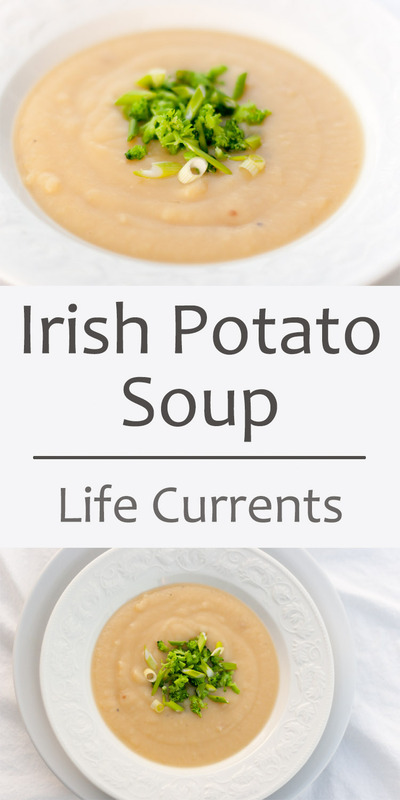 When making this soup for an Irish holiday, you might want to bump up the Irish-quotient by topping it would some cabbage or kale. You could serve it as the first course before the big corned beef. And, of course, have a cup of Irish Coffee to go along with it. Or, if it’s not being served for an Irish holiday and it’s just being served for, say, Tuesday night dinner. Then, by all means, top it with whatever pleases you: broccoli, sour cream, blue cheese crumbles, green onions, a dollop of pesto, shredded cheddar cheese, some red chile sauce, or, use whatever suits your fancy. Tomorrow I’ll show you how I used some of the leftovers for Seared Albacore Tuna. Yummy. Preheat oven or toaster oven to 400° F. Cut off pointed end of the garlic head to partially reveal cloves (do not peel or separate the cloves); place the garlic in the center of a small sheet of heavy-duty aluminum foil. Drizzle ½ teaspoon oil over garlic and sprinkle with a pinch of salt; wrap in foil. Bake at 400° for 45 minutes; cool 10 minutes. Squeeze to extract pulp; discard skins. Heat 2 teaspoons oil in a large pot or Dutch oven over medium-high heat. Add onion; sauté 15-20 minutes, stirring frequently, until onions begin to brown and caramelize. Stir in pepper, ½ teaspoon salt, and potatoes; sauté 2 minutes. Add broth; bring to a boil. Reduce heat, and simmer 20 minutes or until potatoes are very tender, stirring occasionally. Pour potato mixture and garlic pulp into the bowl of a blender, and carefully blend in two batches until smooth and creamy. Or, use an immersion blender to blend the soup directly in the large pot. Stir in milk and the Parmesan cheese. Cook over medium heat, about 5 minutes or until thoroughly heated. Taste for seasonings, adding salt and pepper as desired. Ladle soup into bowls. Garnish as desired. Enjoy! I used 2% milk in my soup because that's what we commonly have in the house. You can use any type of milk that you like best from skim milk to whole milk. I might avoid vanilla soy milk, as it'll add an underlying sweet flavor that may seem the soup taste "off". But, plain soy milk will work just fine. Got any left for me? Looks and sounds amazing!